There are many reasons that dynamic, risk-managed strategies can benefit investors of all ages. The impact of sequence of returns for retirees is one of the more important ones. “What if? A probability-based approach to market uncertainty,” a recent article in Proactive Advisor Magazine, is one of my favorites on investment theory for client portfolios. I urge you to check it out if you have not already. This article talks about the wisdom of constructing a well-diversified portfolio that consists of several different dynamically risk-managed strategies. It also explores the concept of “core” and “satellite” strategies. “[Do] not place too few eggs in your portfolio basket. You need to invest in a large number of strategies to reflect the different types of market environments that are always possible. Why is that so important for clients? Over the history of the U.S. stock market, given a long enough period of time, equity investors have been rewarded with growth in their portfolios. However, they have obviously faced periods of extreme volatility and steep drawdowns for those same portfolios. According to data from Yardeni Research, every decade since 1920, with the exception of the 1990s, has had at least one market decline over 20%. Most of those declines were much worse. Source: Yardeni Research, market data. Declines measured from peak to trough of correction period. However, for someone about to enter retirement and begin the distribution phase of their nest egg, as opposed to accumulation, a 25%–50% hit to their retirement funds early on will wreak havoc on their planned withdrawal rates. There is a good chance their funds will no longer last throughout a lengthy retirement. Additionally, the mathematics of bear market losses makes portfolio recovery difficult, as it takes a gain of 50% to overcome a 33% portfolio loss—and a 100% gain to overcome a 50% loss. 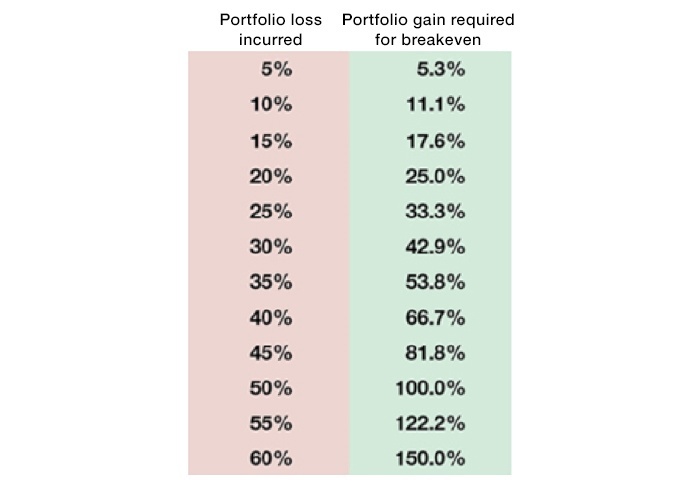 As losses increase, the percentage gains needed to attain breakeven accelerate at a faster rate. To greatly simplify the idea, imagine these people planned to retire with an investment portfolio of $1,000,000 available to help fund their retirement withdrawals for the next 30 years. If they gained 40% in the first years of retirement, their $1.4 million would surely go a lot farther than the $600,000 they actually ended up with at the end of 2002, less withdrawals! While it is unlikely anyone was 100% invested in stocks, the concept still holds true. “Three investors made the same initial hypothetical investment of $1,000,000 upon retirement at age 65. “All had an average annual return of 7% over 25 years, but each had a different sequence of returns. “All made annual withdrawals of $60,000, adjusted annually for inflation. Looking at their hypothetical portfolio values at age 90, “Investor A,” who had positive returns in the early years of retirement had just over $1 million. “Investor B,” who had relatively steady returns throughout retirement, had $500,000. “Investor C,” who experienced poor returns early in retirement, ended up with a zero balance. This example of the sequence of returns makes a strong case for dynamic, risk-managed strategies that can mitigate the worst of bear market losses, especially for retirees or those on the cusp of retirement. This article, written by a third-party investment-strategy consultant, finds that less-volatile, better risk-adjusted returns (as opposed to “average annual returns”) can result in “significantly more money in retirees’ pockets” over a lengthy time frame. But what about those who are not close to or in retirement? I think the industry often ignores the sequence-of-returns issue for other investors. What about a couple in their 30s with young children who are planning on their first home purchase? How about a couple in their early 50s who are about to see children go off to college? If their savings/investments are exposed without risk management to the whims of the market, the same principles are in effect—the timing of investment returns can devastate their plans. There are many reasons that dynamic, risk-managed strategies can benefit investors of all ages. I think the sequence of returns is one of the more important ones.